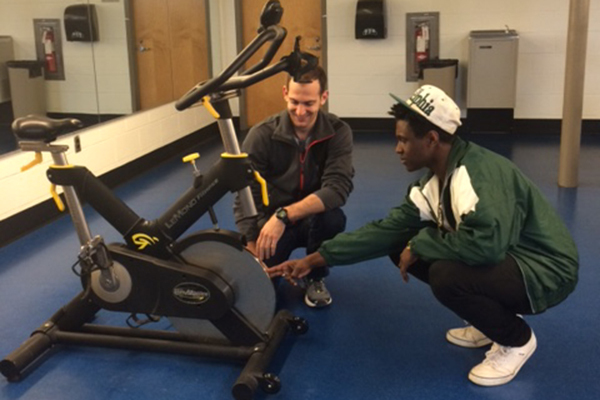 Garrison Davis and Thomas Brady, students behind the Little Bob Initiative, examine their prototype bicycle. 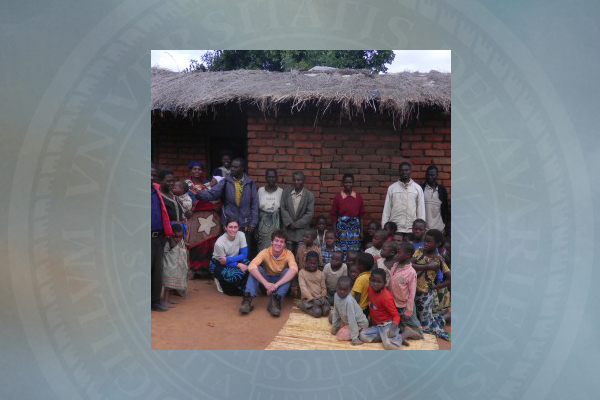 Students of UD’s Engineers Without Borders chapter pose with members of a Malawi community while working on a water project there. 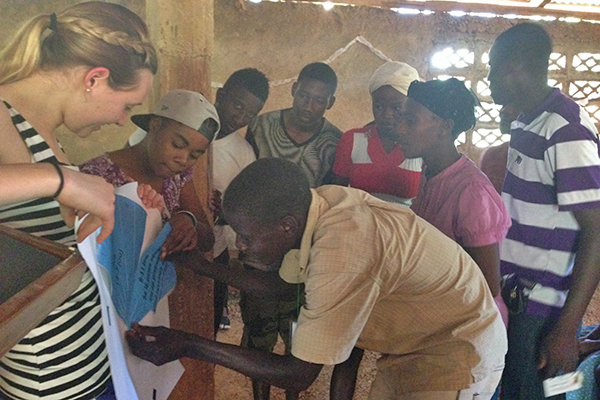 Haitians learn about women’s health topics during a program led by the student-created FEMpower organization. 1:50 p.m., May 14, 2015--University of Delaware students who attended the Clinton Global Initiative University (CGI U) this past March have received seed funding from the organization to advance three projects. Fifteen UD students attended CGI U this spring after having developed “Commitment to Action” initiatives that strive to make a difference in one of CGIU’s five focus areas: education; environment and climate change; peace and human rights; poverty alleviation; and public health. Attendees were then encouraged to submit their projects for seed funding consideration. Such funding is essential for these student groups as they continue to implement and expand their projects. Three of these student projects – the Little Bob Initiative, the Malawi Water Project and FEMpower – were selected to receive seed funding from CGI U.
UD’s Engineers Without Borders (EWB) chapter is the student group behind the Malawi Water Project. Kyle Lusignea, a junior chemical engineering major and president-elect of EWB, Dakota Rawlings, a junior chemical engineering major, and Arvind Annamalai, a sophomore chemistry and biomedical engineering major, are all members of EWB and Malawi Water Project leaders. The EWB initiative, focused on communities in Malawi’s Sakata region, is working to improve access to water resources. Partnering with a non-governmental organization (NGO) in Malawi called Villages and Partnership, a number of UD EWB members, a professional mentor engineer, and Gretchen Bauer, chair of the Department of Political Science and International Relations and sub-Saharan Africa expert, made an assessment trip to the community last summer. During the journey, they collected data, assessed natural sources of water and examined methods to catch water, including catchment systems that utilize rain water, wells that use groundwater and supply systems that re-divert streams or lakes. They will conduct a second assessment trip this summer before entering project phases of implementation and maintenance. Emily Zhang, a senior biological sciences major, is one of the founders of FEMpower, a student-run organization that works to provide education about unplanned pregnancy to women in Haiti. Along with co-founders Jaewoong Yoo and Sarah Mottram, they created materials and a comprehensive workshop on women’s health. Zhang and Yoo had traveled to Haiti after the 2010 earthquake to work with the Haiti Family Initiative. Volunteering in the medical clinic, they saw that a lot of health issues centered around women and children. They also found that there was a lack of knowledge. Partnering with UD’s School of Nursing, they created holistic posters, videos and activities that focus on life planning, preconception health and reproductive health. Zhang, Yoo, and Mottram brought their program to La Montagne, Haiti, where they led weeklong workshops in the spring and summer of 2014, as well as spring of this year. With a team of eight translators, they conducted pre- and post-tests of reproductive knowledge, taught through activities and posters, and led discussion groups. In fact, while their program was originally targeted solely toward women and women’s health topics, the interest of men in their workshops has been profound. To accommodate their interest and participation, FEMpower’s workshops will last three weeks this summer to include topics like emotional health, healthy relationships, father involvement and male reproductive health. As they expand their program, the funding they received from CGI U will have important implications. It will allow them to create more programming materials for their new topics, and it will enable the team to create additional materials that can be used by Haitians to continue teaching each other once FEMpower’s summer program culminates. While FEMpower and the Malawi Water Project have international scopes, the Little Bob Initiative is focused on the UD campus community, specifically the fitness facilities in the Carpenter Sports Building. Garrison Davis, a senior organizational and community leadership major, built upon an idea in his first leadership course to create a project that would use exercise equipment to generate electricity. Davis, who attended CGI U in 2014 and was invited in 2015, used the opportunity to network, learn about other participant's projects, and develop his own. Partnering with Thomas Brady, a senior electrical engineering major, the Little Bob Initiative was born. Davis and Brady are working to create a prototype stationary bike that through use will generate electricity. Seed funding they received from CGI U will allow the students to obtain needed materials for their prototype and to further develop it. They hope to finish their first model this summer so that it can be placed in the Little Bob and tested for durability and efficiency. With currently more than 60 stationary bicycles in the Little Bob, their hope is that they will be able to generate clean energy through an activity in which UD students already participate – exercise. UD students are encouraged to learn more about Clinton Global Initiative University. For more information regarding application dates and deadlines, contact Meng Fan, a graduate assistant with the University’s Institute for Global Studies.